8 bungalows, each of 4 apartments – 6 persons, including: 2 bedrooms (bedroom on the ground floor 1 140 bed + convertible sofa, entresol bedroom 1 160 bed), 1 living room with non-convertible corner sofa, open-plan kitchen equipped with fridge and sink – NO POSSIBILITY TO COOK, TV, bathroom with shower, large roofed terrace. Apartments no. 8A and 8B do not have entresols (1 bedroom for 4 persons). No towels. Are you interested in a self-catering holiday? Click here to view the full price list of a self-catering stay! 1. Discounts do not apply to organized groups. 1. PROMOTION for dear little ones applies to reservations at regular prices from the price list. 2. Discounts do not apply to organized groups. It is not possible to book an Apartment and a Large Cabin for one person. When booking an Apartment and a Large Cabin for 2 people, there is an additional payment of 500 PLN / week. When booking for one person – a Small Cabin, Terraced Houses B, C, D, E, F, and a hotel room in Unit A, there is an additional payment of 400.00 PLN / week. The reservation is valid for 3 days from the date it was made. During the pre-booking period, a Client should pay to SIMAR Sp. z o.o. an advance payment equivalent to 30% of the gross price of a stay (calculated on the basis of the total price for rent and meals). The initial reservation expires if, on the above-mentioned date, no advance payment is made to the bank account of SIMAR Sp. z o.o. 11 5-person CABINS, cabins: 31, 32, 33, 34, 35, 36, 37, 38, 39, 40, 41. 2 bedrooms (first bedroom 1 140 bed, second bedroom sofa + convertible sofa), living room with non-convertible corner sofa, open-plan kitchen equipped with sink, fridge, TV, bathroom, terrace. No towels. 15 HOUSES with 2-4 beds, houses: 42, 43, 44, 45, 46, 47, 48, 49, 50, 51, 52, 53, 54, 55, 56. Houses have 1 room, bathroom (WC, shower), roofed terrace, fridge. They have 1 140 bed + convertible sofa, TV. No towels. 2-5-person houses with fridge and TV. Most of the houses have an open-plan kitchen and roofed terrace. No towels. Unit C, D, E, F, B25-30, B8. 2-4-person rooms with fridge and TV. Rooms from 1-10 and 12 without balconies with single sofa beds. Rooms 11, 13-21 with balconies. 1 bed 140cm + sofa bed, bathroom with toilet and shower, TV, fridge. The rooms do not have towels. Room B7 (unit B): 4 – 6 people. It has two rooms. Living room with separate sleeping annex (bed 140cm) and kitchenette. In the second – one bed 140cm with a window outside. The room has a bathroom, TV, a large covered terrace, a fireplace. There is a possibility to place a cot. The room has no towels. Rooms from 10 – 17: 4-5 bedded rooms, 3 single couches. A double bed on the mezzanine. Bathroom, TV. The rooms do not have towels. Exit to the shared terrace. Room No. 18: a 4-person room. The room has 4 single couches. Bathroom, TV. The rooms do not have towels. Exit to the shared terrace. Room number 19 – 24: rooms for 3 – 4 persons (3 – 4 single couches). Bathroom, TV. The rooms do not have towels. Exit to the shared terrace. Using the swimming pool you can cool yourself with a cold drink in Our Pool Bar. A beach bar which serves drinks, sweets and popcorn is located at the descent to the beach. For vacationers who do not like too cool sea water and prefer swimming in fresh water we have a brand new swimming pool where a lifeguard always watches over. For our Small Guests we offer a paddling pool with heated water which is an alternative to the cool sea. 1 treat – grilled sausage at the Tavern. In our Resort Centre there is a Jacuzzi, where you can relax and rest after a sunny baths by the sea. For groups, camps, green schools, we can arrange a campfire at the resort centre. In the Resort Centre there is a mini football pitch (36m x 58m) with a natural grass surface. For those who want to spend their holidays actively, we offer the possibility of renting bicycles and Nordic walking poles. Ideal for bad weather days and those who care about their wellbeing we invite you to relax and unwind. In the Resort Centre there is a court for volleyball (beach) with a sandy surface. We have been running a new cafeteria in the resort centre “Wrzos” since 2016, where our guests are treated with delicious meals served to the table/in a form of a buffet. We invite you to a tavern “At Skipper’s” in a separate area (entrance from Sztormowa Street) offering, among others, delicious coffee and cakes, tasty barbecue meals and a variety of fish and seafood meals. Our offer will be complemented by music, delicious drinks and be beer for all generations every evening. The resort centre has a full-size tennis court with artificial surface available for our guests. WRZOS resort centre is a friendly holiday complex located in Sianożęty near Ustronie Morskie, just 15 km from Kołobrzeg. Our Guests have at their disposal a direct descent to the beach, a wide range of attractions, rooms with full sanitary unit, access to satellite television and beach equipment. The resort centre is located by the sea. Direct access to the sea, wide, clean, sandy beach. 8 bungalows, each of 4 apartments - 6 persons, including: 2 bedrooms, living room with non-convertible corner sofa, kitchen. 11 5-person CABINS, 2 bedrooms, living room with non-convertible corner sofa, kitchen. 2-5-person houses with fridge and TV. 2-4-person rooms with fridge and TV. 4 - 6 people, 2 rooms. The room has a bathroom, TV, a large covered terrace. There is a possibility to place a cot. 2-5-person rooms with fridge and TV. We serve delicious and hearty meals in the cafeteria, and we invite you to our traditional now free barbecues and fun with music at our tavern. 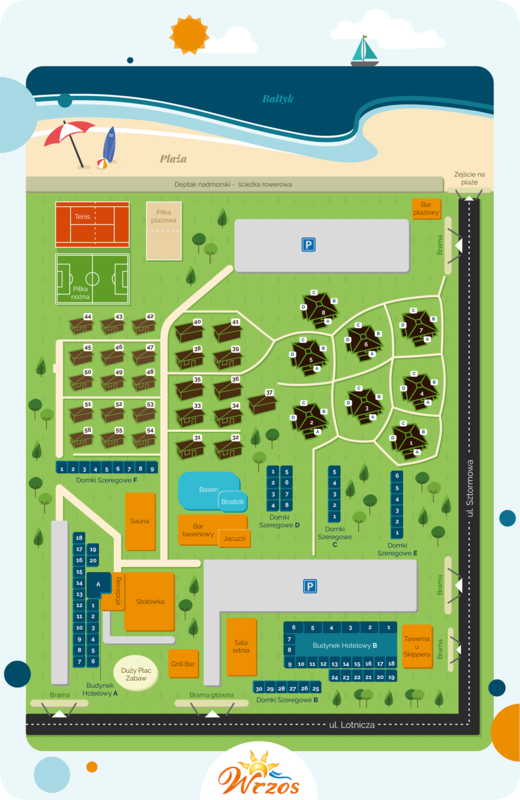 See the map of the resort centre. for yourself and your family! According to the RODO, the data provided in the form are only used to contact you for the purpose described in the message. Data are not sent to any mailing databases, they are not processed or used by third parties. WRZOS RESORT CENTRE – The Summer Price list for 2019 is Now Available!